“...In July 1863 a party of Winnebago visited the farmhouse of George Salter, six miles north of New Lisbon, while he was away. (George Salter’s business, to a large extent, appears to have been to furnish the Indians with whiskey.) He returned with his children to find the house ransacked and his wife dead. She had been badly beaten, her throat had been cut, and she had apparently been raped. When a drunken Indian appeared near the house, Salter killed him, and a German neighbor took a grub hoe, cut off the dead Indian’s head, and stuck it on a pole. When another Indian came by, Salter beat him to death with an axe handle. “...General Pope dispatched to New Lisbon a company of the thirtieth Regiment, for the protection of the Indians as well as the whites. 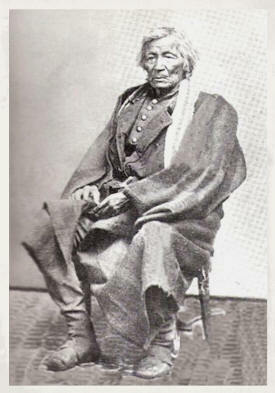 The military also arrested several Winnebago leaders, including Chief Dandy, and held them “more for their own protection against the excited white settlers than for any crimes or depredations.” While under arrest, Dandy told Indian Agent Davis he would be willing to turn over Mrs. Salter’s murders to the white authorities but could not do so until he had been freed. After his release he talked with (Wisconsin Governor) Solomon and gave assurances for the good behavior of his tribes people. 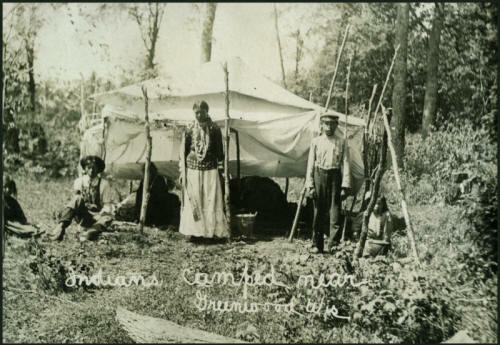 “A few Winnebago, those who owned land and lived on it in more or less the manner of the whites were well accepted and even highly respected by their white neighbors. Outstanding among these few was Chief Yellow Thunder. Along with the rest of his tribe he had been forcibly removed to the west of the Mississippi River in 1840, and like many of his fellow tribesmen he had returned as soon as he could, he and his wife walking nearly 500 miles. On his return he bought forty acres in northeastern Sauk County, built a log house on his land, and settled there with his wife. After his wife’s death in 1868 he seldom stayed in the log house, but lived most of the time in a tent that he pitched near the Wisconsin River. Tall, stately, he dressed much like a white man except for the inconspicuous black ribbon ornament in his hair and the blanket he wore in resentment on account of the dispossession of his people. In the fall of 1873 a knee injury led to blood poisoning for Yellow Thunder, and his white neighbors helped to care for him in his final illness. Before he died the federal government made another attempt to remove the Winnebago from Wisconsin. 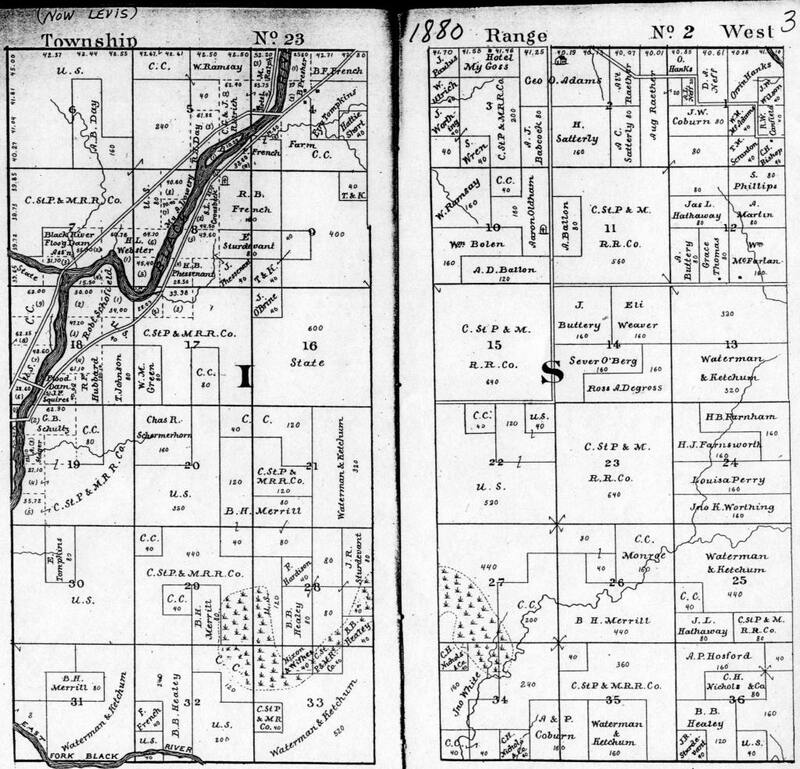 There were and still are properties in many of the Clark Co townships simply listed as “Indian Land”. 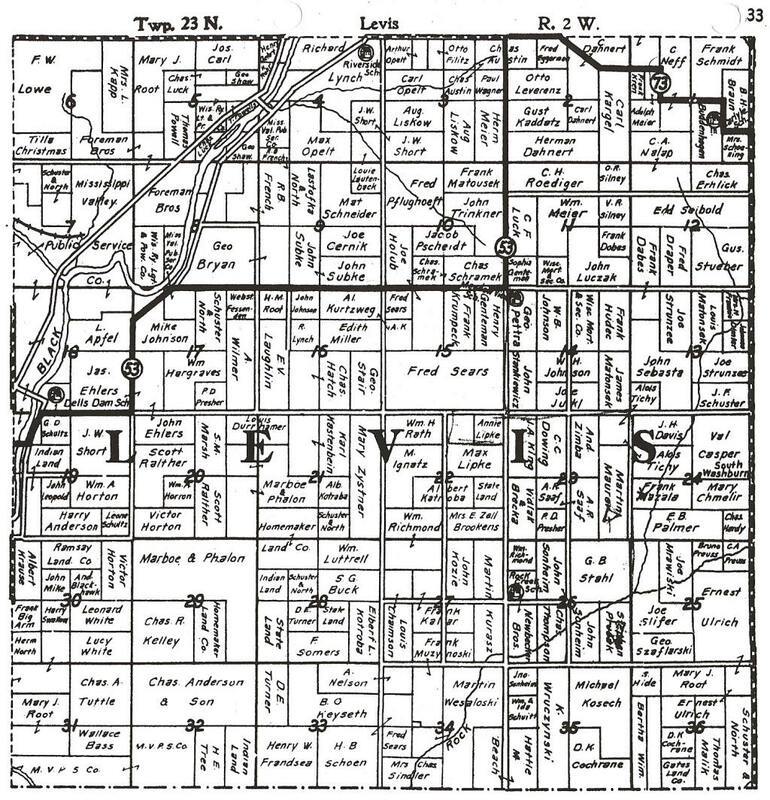 The Clark Co townships (Dewhurst, Levis, Washburn, Sherwood) along the northern border of Jackson Co (location of the Winnebago Indian Reservation) was the logical location of those Indian families wanting to be close to but not living on the Reservation. A license was required for “white” marriages but apparently not for Indian marriages. Births, regardless of race, were not always reported and many reports were delayed until the need for a birth certificate arose. Death certificates were required prior to burial for “whites” but not for Indians according to the cemetery records. A search of the on-site information revealed the following Indians on the Clark County, WI pre-1907 indexes. Indians Camping Near Huntzicker's Woods, 1917 ca. 1877: Last Wednesday evening, about twenty-five Indians, men and women came to town and broke the monotony of these dull muddy times. They gathered at the Firemen’s Hall and quite a number of our citizens watched the festive affair. August 1931: The Neillsville baseball team, after defeating Abbotsford 6 to 1, Sunday at the Fairgrounds, lost some of its speed and dropped the second stanza of the double header to the Collegians, 4 to 3. April 1934: Mrs. Anna Davis, Winnebago Indian, about 80 years old, died April 5, at the home of her daughter, Mrs. Ray White, at Dells Dam. Mrs. Davis had been ill all winter. She is survived by Mrs. White, as two other daughters have preceded her in death. Burial was made in the Indian Cemetery at Dells Dam, tribal services being used. In conformity with the Indian custom, a “wake” was held, lasting four nights. On the first three nights, supper was attended by more than a dozen relatives and friends, at which tribute was paid the departed member of the tribe. On the fourth night, the group remained up all night during which several Indian veterans of World War I told of their experiences in the army. August 1934: The Silver Dome baseball team played the Hatfield CCC camp team Sunday at Hatfield, winning 9 to 1. The Silver Domers are now leading the league. Later, the Pleasant Ridge baseball team defeated the Silver Dome team in a 10 inning battle, 5 to 4. August 1934: The discovery Monday, of an old human skeleton by Ferdinand Wittke on his land (Weston sec 28, SE corner) north of the Neillsville Mounds, brought Deputy Sheriff Herman Olson and Dr. M. C. (V.) Overman, County Coroner, scurrying to the Scene. They came to the conclusion that the bones were those of a young Indian woman who died about 25 years ago. According to Mr. Wittke, he and his son, Lester who have been building a fence along an old Indian trail, became curious of a depression in the ground near the fence line. The earth appeared to have been disturbed recently. August 1945: Pfc. Benjamin Winneshiek, Neillsville Indian, has received his honorable discharge from the Army. Benjamin was graduated from the Indian School here about six years ago. His parents, Mr. and Mrs. Willie Winneshiek, now both deceased, formerly lived at Dells Dam. His brother, John, was formerly employed at the Indian School, here. He and his family now live in Madison. Benjamin left here with the Service Company in October of 1940, receiving training in Louisiana then went overseas to the Pacific area. He fought with the 32nd Red Arrow division and saw considerable action in the Burma campaign, in New Guinea. He also took part in the landings at Hollandia and Leyte and later moved up to Luzon in the Philippines. It was during the latter campaign that he was notified of his discharge under the point system. Pfc. Winneshiek was awarded the Bronze Star medal for heroic action when a medic truck was in danger of Jap sniper fire. Winneshiek drove his own truck into a dangerous position and in so doing rescued two wounded men. "The Indians are all scatter it over to work any where they found. Many are going to cherries land last two weeks and those who work small orchard they all finished came home." April 1951: Corporal Mitchell Red Cloud was posthumously awarded the Congressional Medal of Honor Tuesday, April 3, in the Pentagon at Washington D. C. Dying as a hero, he is the eighth soldier to be awarded the Medal of Honor for participation in the Korean campaign. The presentation of the medal was made to his mother, Mrs. Nellie Red Cloud. The ceremonies took place in the Pentagon at Washington D. C. The medal, presented to the mother, was made by Gen. Omar N. Bradley, chairman of the joint chiefs-of-staff. August 1953: “The Neillsville Public Schools have acquired 60 acres of land near Lake Arbutus for a school forest. 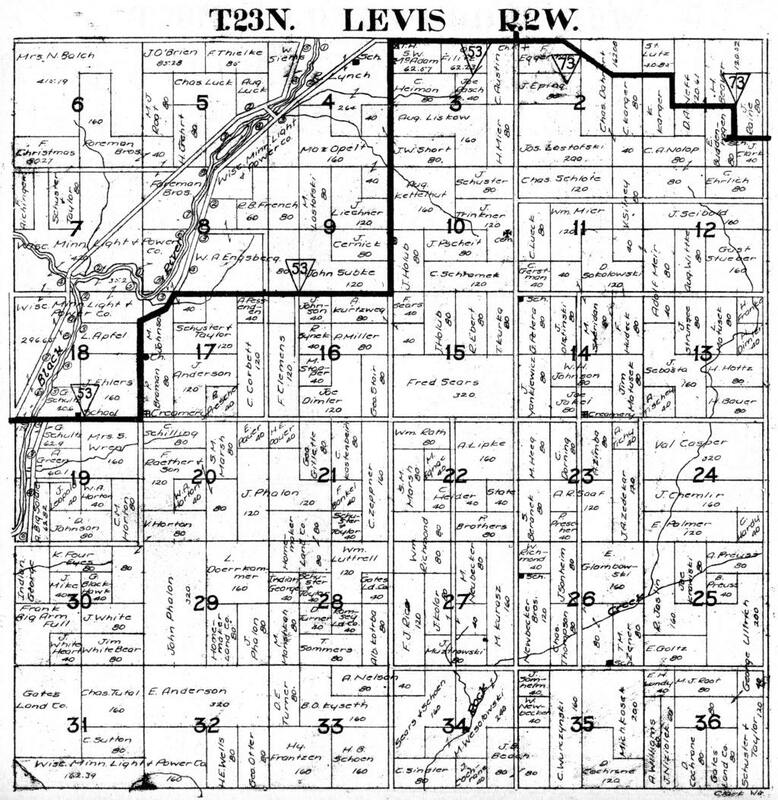 The land is in Section 30, town of Levis, in the neighborhood of the homes of two Indian families, the Jesse Mikes and the Thompsons. 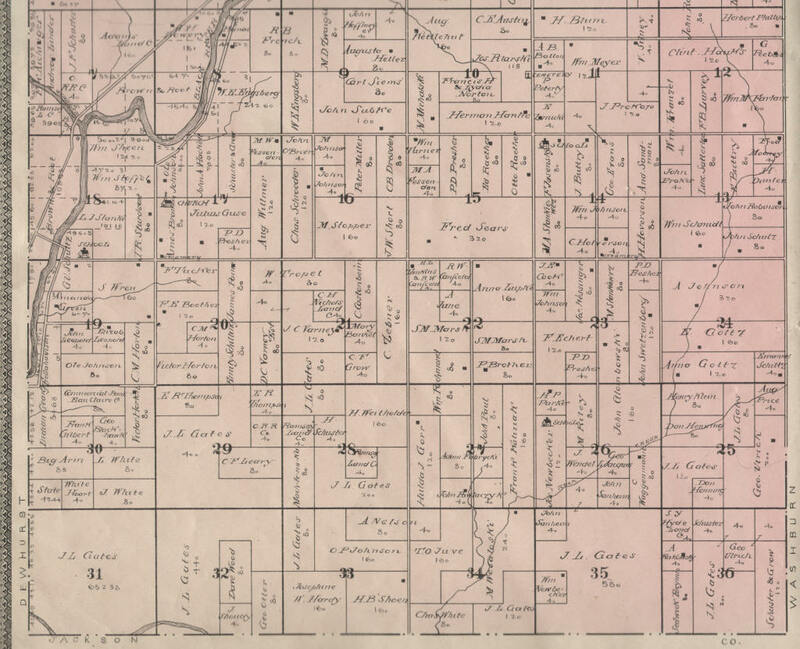 When the school district moved to acquire land in that area, the original purpose was to get 80 acres. But it was found that the land desired, though belonging to the county, had upon it the home of Thompsons and grounds used by the Indians for camping and ceremonials. c1870: “There were several good midwives in the community. One, Kate Scott, an Indian woman, who lived near Longwood.” Greenwood History 1853-1934 Note: Kate Scott was midwife at Will Huntzicker’s birth on Nov 6 1871. “Scott, Kate, Indian woman who was the oldest settler in the town of Green Grove loved to roam the woods with her rifle and could handle that weapon in a most masterly manner.” [News clip, page 55, column 2] Colby Centennial 1873-1973 Note: Kate not found on early census records or later cemetery records of Clark Co.
C1915: “...The Dells Dam Indian Reservation was well known to many of the early settlers. The Winnebago Indian tribe was quite concerned about educating their youngsters and settled near the school. Harry Swallow’s granddad, Joe Bearheart, built a teepee near the south side of the Schultz farm and the family lived in it during the winter months while the children attended the Dells Dam School. During the summer months they moved back to the Indian Reservation. Andrew Blackhawk built a hoagen in the woods on the north side, east of Gabby Schultz’s house as it now stands. C1887-1924: Mrs. John (Mina) Kippenhan, daughter of Carl and Louisa Franz, was born June 11, 1863 in the Town of Herman, Sheboygan Co, Wis. At the age of 20 years she came to Clark Co with her parents. On March 23, 1887 she was united in marriage with John Kippenhan. To this union 13 children were born. 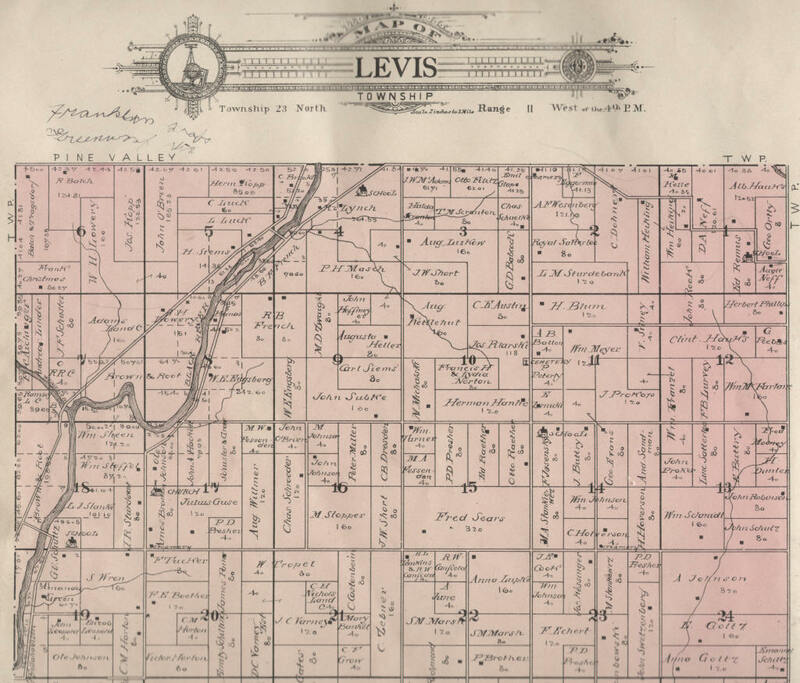 Mr. and Mrs. Kippenhan moved on a farm in the Town of Mead and lived there until 1924, when the moved to Appleton, Wis... She was ailing for some time but her death came suddenly on Saturday evening, May 3, 1941. One daughter, Helen, preceded her in death in 1931... Funeral services were held at the West Side Church, with Rev. Franzmeier officiating, assisted by the Rev. Guenther of Appleton... Those attending the funeral from out of town were the following:... Mrs. Viola Young Thunder, Joe Payer and Barkley Payer, Black River Falls, Wis., Rev. Ben Stucki, Miss Gretchen Hauser, Mrs. Rose Eberhardt, Mr. Mark Vornholt, Rev. Wilson Bixler, Miss Lena Burkart, Miss Mary artz, Herbert Lone Tree, Emmanuel Falcon, Jennie May Thunder Cloud, Madeline White Eagle, Rosanna White Eagle, Neillsville. Dr. E. O. Humke, Mis Esther and Ida Humke, Sturgeon Bay, and Philip Mattes, Sr., Thorp. The Kippenhan-Franz family must have been special judging by the number of Indians who came to pay their last respects.